Robots have become partners in the laboratory. 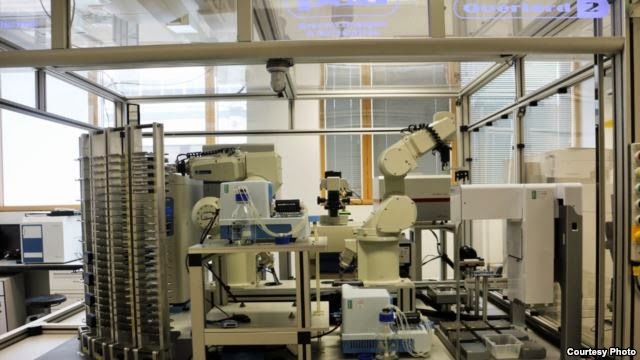 As at the University of Manchester in the UK, a robot scientists named Eve have discovered compounds that are known to have anti-cancer potent that also can be used to develop as the drugs of malaria and other tropical diseases. Eve follows in the footsteps of Adam, another robot scientists that created by Automation Laboratory of the university in 2009 to conduct research. Adam and Eve did not look like a human. They are square shaped and about the size of a car. They have qualities such as robotic machine that you may have seen in the automotive industry. Ross King, the team leader says that Adam has made a lot of discoveries in the field of yeast, a fungus used in biology as a model of human cells. "Adam took a hypothesis on the function of that particular gene in the yeast and test the hypothesis through experimentation and confirm it," he said. "So Adam took the hypothesis and confirm the new scientific knowledge." This is the first for the robot. The success of Adam became the basis for Eve. And Eve science mission focuses on tropical diseases and rare diseases, which took the lives of millions of people and infects millions. King says the condition is ignored because it is generally slow drug development and costly. It takes a decade or more to be able to market a new drug, and it will cost about $ 1 million. Drug manufacturers may not benefit from that investment. King said the University of Manchester to develop an inexpensive test kits, the test that indicates whether the chemicals could be good medicine, and commissioned Eve to do some research. "The conventional way of working is to use robots and a collection of many drugs," he said. "Testing each compound being tested. So the record of a compound taken from the beginning and continues until finished, then quit. The process is not too smart. Robots do not learn anything when the test is running, although it has been tested millions of compounds, still do not know what will happen when testing new compounds." This is a difference of Eve than other robots. This robot learn when to test, King explains, "so that it could then eliminate compounds that are not good and only test the compounds that have the highest probability to be useful." That's how's Eve accidentally discovered a compound that may be able to treat malaria and other tropical diseases. King hopes this process can be fully automated, where robots perform tests and make the process of synthesis of new chemical substances. He emphasizes that although the robot has become a partner in the laboratory, but the man still in control.